Edward Cella Art & Architecture. 2754 S. La Cienaga Blvd. Los Angeles, CA 90034. 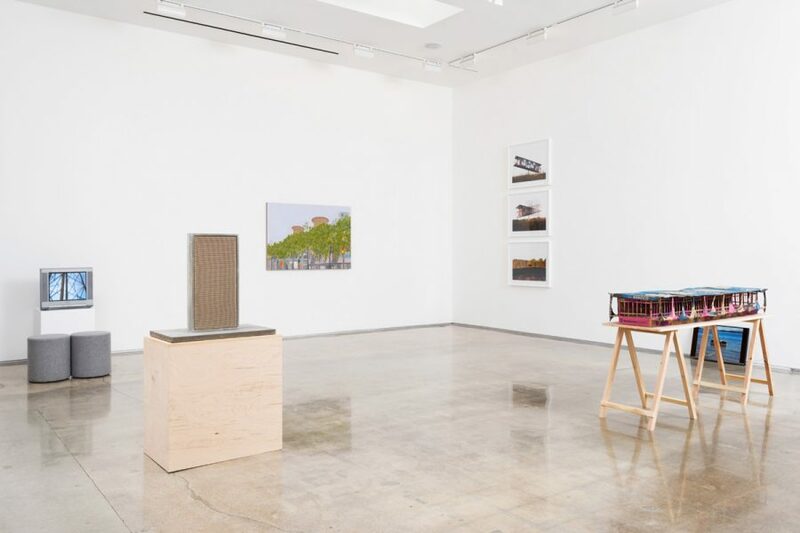 U.S.A.
Edward Cella Art & Architecture presents Vernacular Environments, Part 1, a group exhibition of works selected from the 1960s through present day that explore the diversity of tensions between built environments, bodies, and narratives. 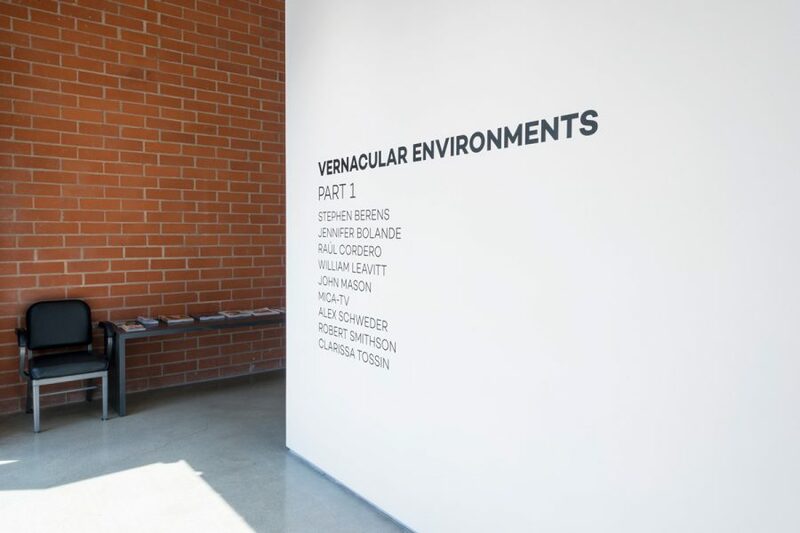 Vernacular Environments, Part 1 is the first of an annual exhibition that asks, what pluralities do you live in? 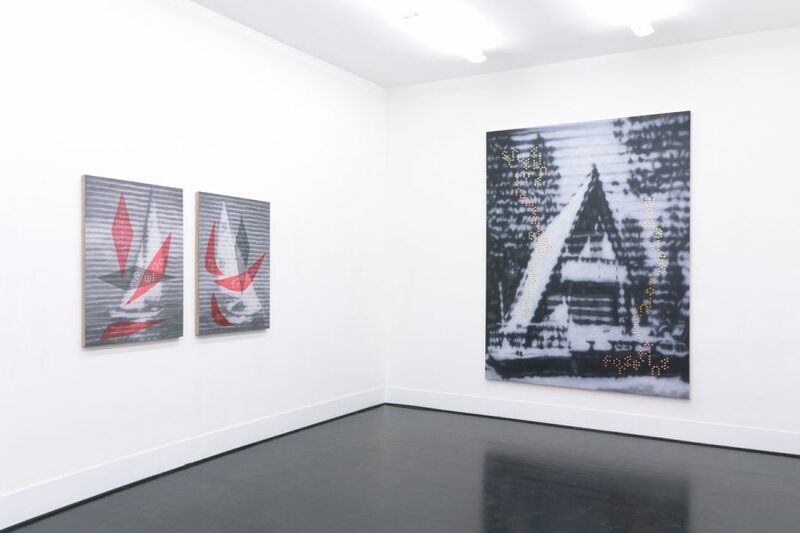 Through varied typologies, the works included in this exhibition present a range of responses to environments and dispute the purity of space while signaling cultural identification through representations of figures, structures, and concepts. 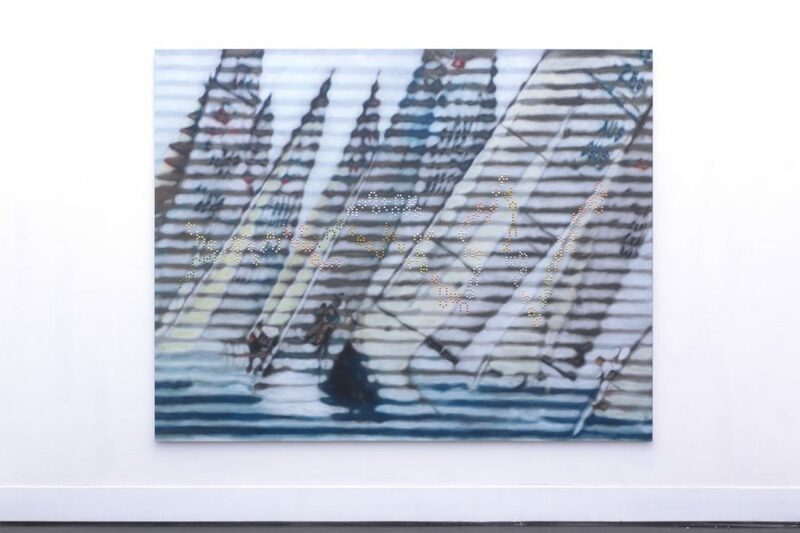 Among the artists featured in this exhibition are Stephen Berens, Jennifer Bolande, Raúl Cordero, William Leavitt, John Mason, Alex Schweder, Robert Smithson, Clarissa Tossin, and MICA-TV (Michael Owen/Carole Ann Klonarides) in collaboration with Dike Blair, Dan Graham, and Christian Marclay. 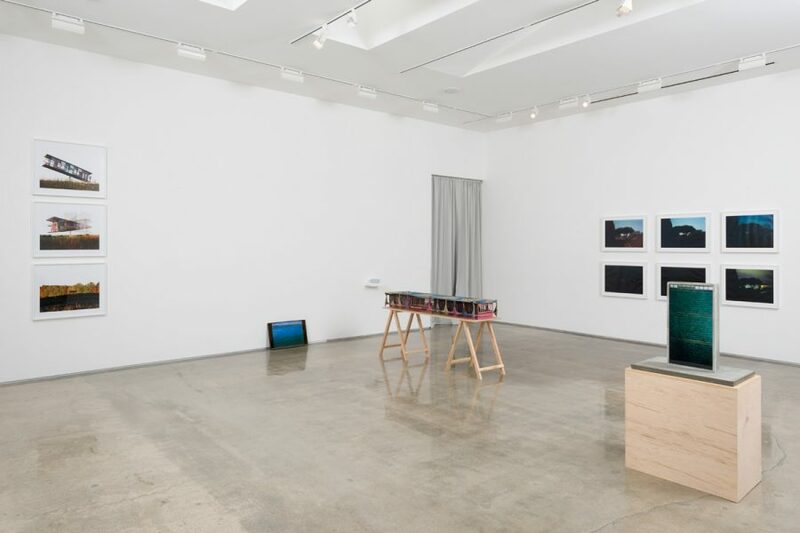 While artists like Berens, Bolande, Leavitt, Mason, Smithson, Tossin, and MICA-TV are well-known and acclaimed on the West Coast and abroad, Vernacular Environments, Part 1 offers a dynamic opportunity to introduce New York based Schweder and Mexico City based Cordero to a West Coast audience and position them within a broader artistic and conceptual dialogue. 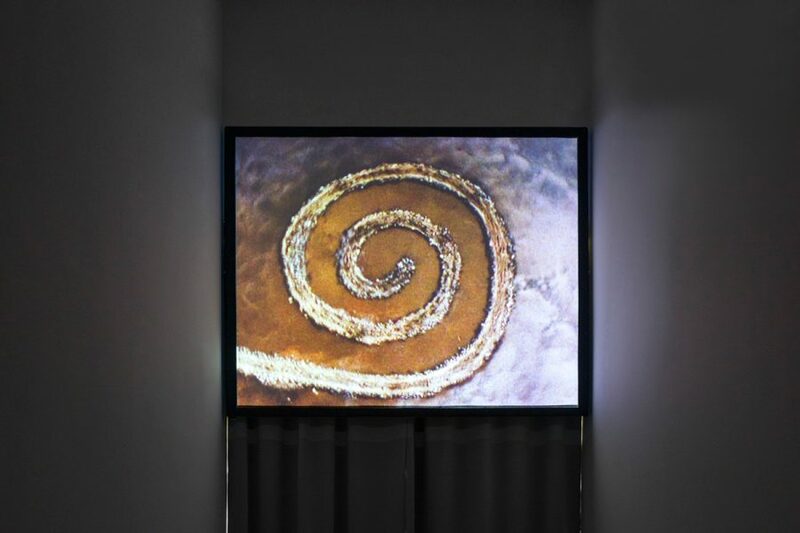 Setting the tone for the series of Vernacular Environments exhibitions is Robert Smithson’s film Spiral Jetty (1970). The film Spiral Jetty is a “portrait” of his monumental earthwork of the same name, created in April of 1970 and permanently situated at Rozel Point in the Great Salt Lake, Utah. Comprised of basalt rocks, mud, and salt crystals, Smithson’s 1500 x 15-foot artwork juts out from the lake’s shore and coils dramatically into luminous red water. The film documents the making of this earthwork, which has attained near mythical status as it has disappeared and then re-emerged from the lake over the past decades. Just as Smithson’s film, photoworks, and drawings are all conceptually integral to the totality of Spiral Jetty, John Mason’s 1978 drawings operate like architectural blueprints for his firebrick sculptures. 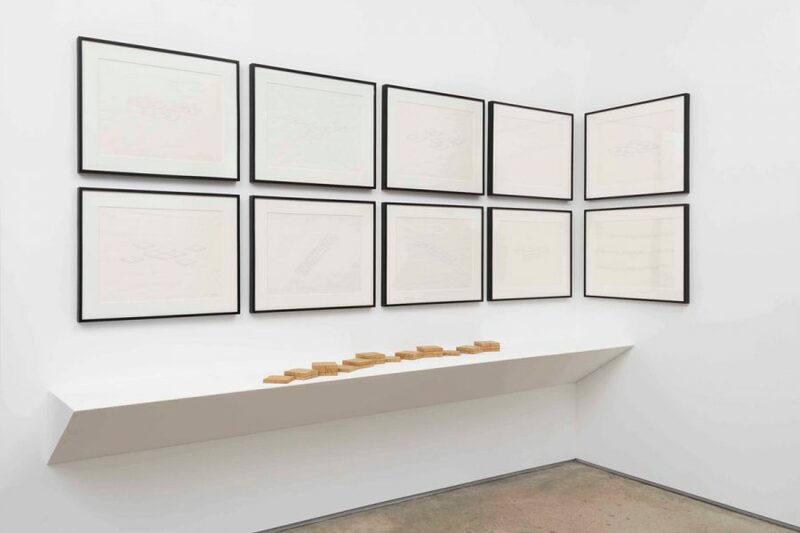 In stark contrast to the expressive clay works which gained acclaim in the late 1960s, these drawings intersect mathematical relationships and geometric descriptions for minimalist sculptures that were meant to be both examined and experienced. 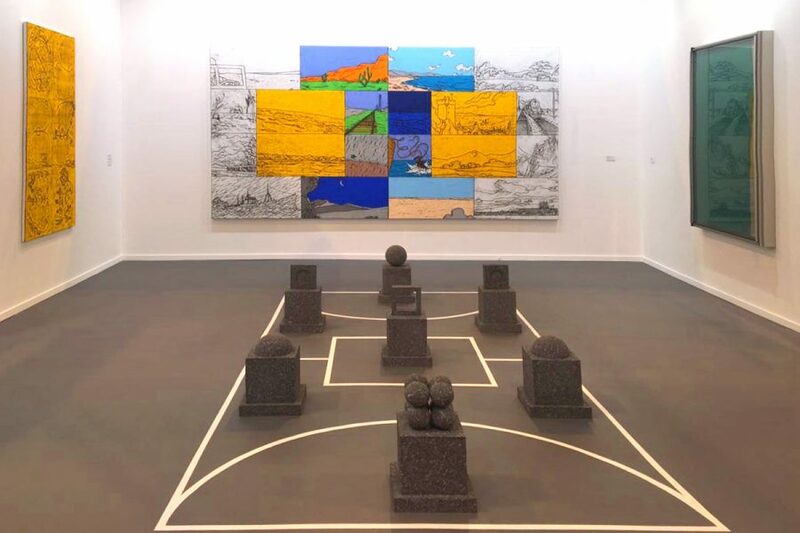 Where Smithson’s built environments were comprised of found rocks and mud, Mason’s commercially fabricated firebrick sculptures and accompanied drawings eradicated any trace of the artist’s hand and allowed Mason to actualize simple plans of symmetry, translation, rotation, and reflection. Integrating humor with specific visual and aural deconstructions, MICA-TV’s (Michael Owen/Carole Ann Klonarides) collaboration with artists Dike Blair, Dan Graham, and artist/composer Christian Marclay, crafts an ironic ode to the urban and suburban architecture of the contemporary American cultural landscape. Visually breathtaking, CASCADE/Vertical Landscapes (1988) is constructed as a continuous parade of vertical camera movements and image layering. MICA-TV borrows “found” sound and images from pop culture to trigger associations and memories. Consumer products and junk food fall like pop cultural debris through a vertical corridor of postwar cathedrals—shopping malls and urban arcades. Structured as a continuous flow of verticality, seamlessly edited and scored, this witty display both critiques and celebrates the contemporary American landscape as inscribed upon the collective unconscious. Operating between the line of reality, fantasy and illusion is William Leavitt’s painting Skyline S.F. (2009) an ostensibly simple narrative painting depicting the city’s skyline in afternoon light. 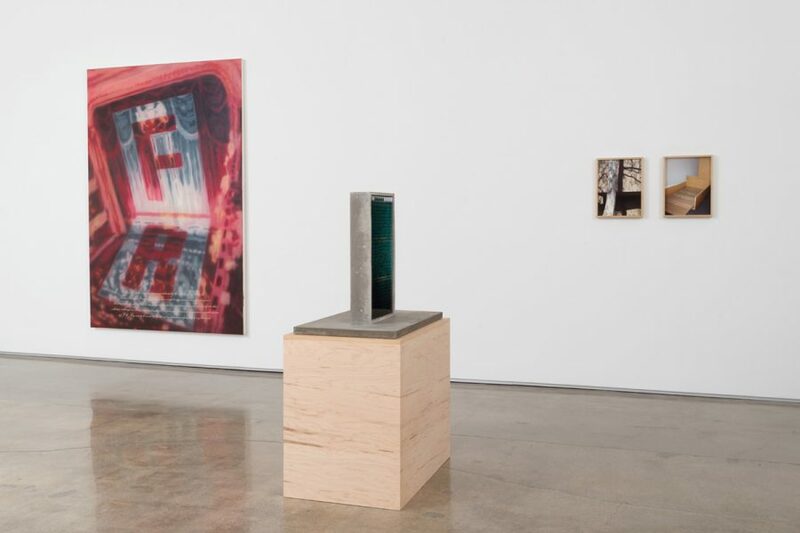 Characterizing California’s urban landscape, Leavitt exposes the narrative potential of our highly syncretic built environment and its tentative relationship to the natural world. Both fantastically strange and supernatural, Skyline S.F. calls attention to the theatricality of urban space. 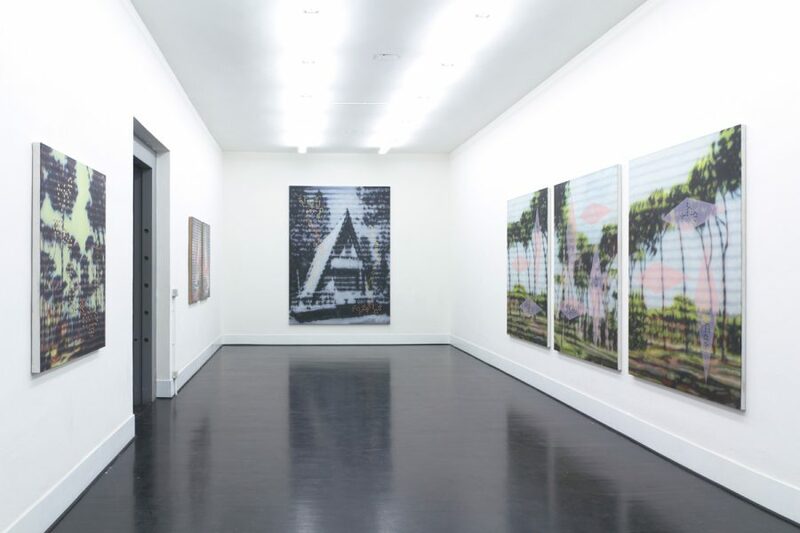 His practice which includes a wide range of activities such as installation, photography, painting, drawing, film, theatrical production, and music addresses architectural vernacular and the patterns of living it impresses upon its inhabitants. 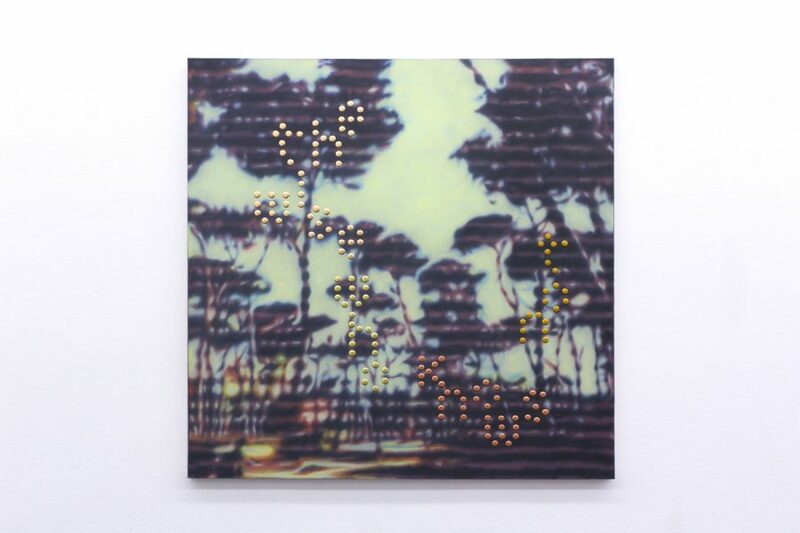 At the intersection of memory and image are Raúl Cordero’s whimsically self-referential conceptual paintings which oscillate between forms of communication: words and images, cinema and video, documentary and narrative, imaginary and realistic. His large oil painting FR (II) (2013) portrays an out of focus aerial view of a theater proscenium with the letter “F” embedded into the theater curtains and the letter “R” on the audience. “FR” refers to the text at the bottom of the painting, an anecdote which describes Cordero’s dedication of an “ugly painting” to his late uncle Famin Rubiales. Upon his art dealer’s donation of the painting to an “important museum,” Cordero consequently receives endless commission requests for similar “ugly paintings”. Cordero’s interest is in when exactly an artwork begins and the constant interchange of people’s positions as they move between here and there, as if it were a memory. Depicting the landscape from one precise viewpoint during a residency at the American Academy in Rome, Stephen Berens’ layered photographs connect the romanticism of landscape photography with critical artistic process. 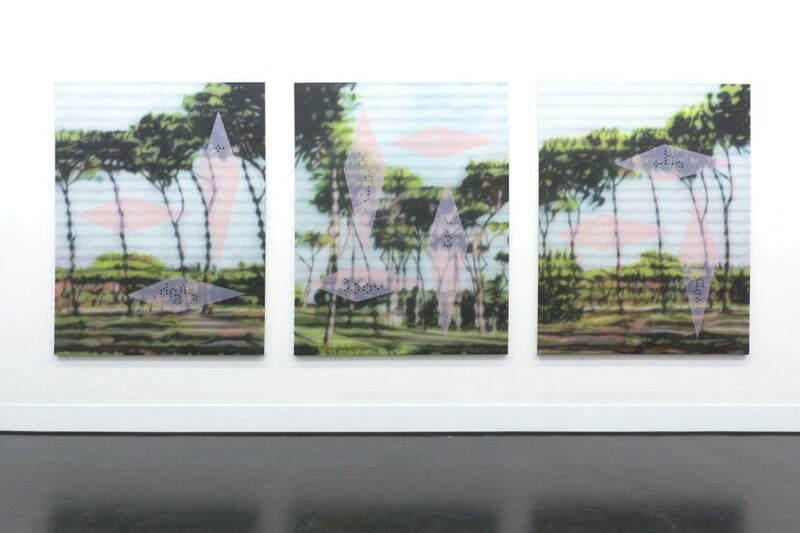 Originally exhibited at the 2014 Whitney Biennial, Berens’ All days are nights (2013-2014) were made out of a previous project entitled 40 Views of Rome (2005). For All days are nights the artist printed photographs on top of one another in a sequential manner. As the series progresses, details in the sky are the last to remain clearly visible and as the layers continue to build the image begins to appear virtually monochromatic. Yet, even in the darkest print (where eighteen images are stacked on top of one another), the basic elements of the landscape are visible, ghost-like in the blackness, a faint memory of its original image. 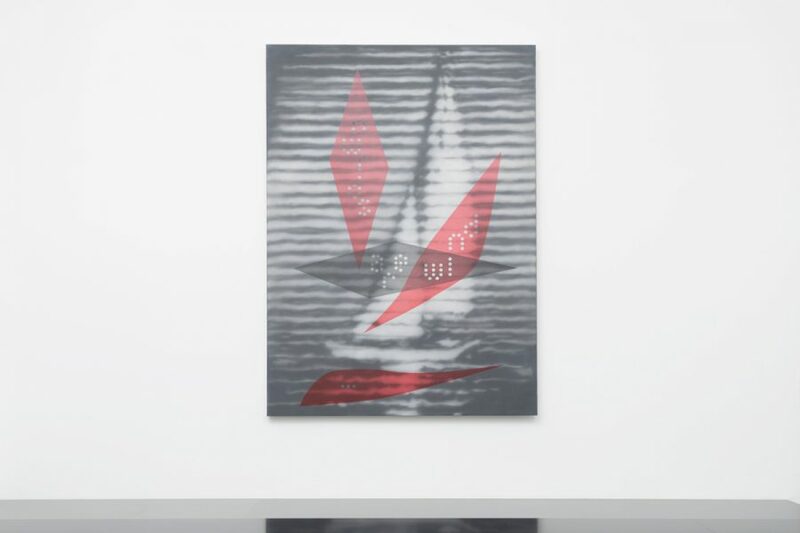 This project represents two major themes in Berens’ practice: the revisitation of previous work as raw material for new work, and an exploration of how working within a generative system can produce unexpected and evocative results. A sequence of photographs and a sculpture will be exhibited by Jennifer Bolande. 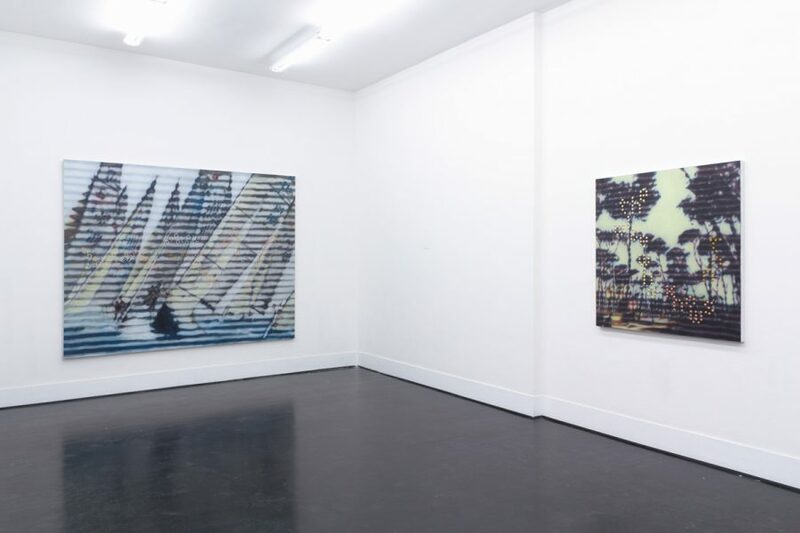 Whereas Berens’ process reveals the illusion of photography manifested in a physical photographic object, Bolande collapses objects into images and creates photographs that resist the medium’s flatness. Her sculptures and photographs call attention to the absurd while upending hierarchies and democratizing objects within their own context. Works such as Model for a Performing Arts Center (2017) a seemingly simple medium format photograph of a cardboard box demonstrates the range of Bolande’s constructed logic, and humor gives way to associative swapping. Her medium format sculpture entitled UN Speaker (2002) is based on the United Nations’ Manhattan headquarters and faced with Fender amplifier fabric, while the reverse has an actual photograph of the building’s façade, transforming this unpretentious amplifier into a monument. Intervening in physical space is what artist Alex Schweder defines as “Performance Architecture,” a process through which he works with everyday domestic actions to transform the ways spaces are used. His ongoing project entitled SOAP (Schweder Office of Architectural Performances) is an experimental architectural office that offers performative renovations of domestic spaces, where little or nothing about the space is altered physically. Offering five one-on-one consultations, Schweder will meet with participants to design performances that, when enacted at home, change the ways that occupants perceive their spaces. Two unique, collaborative commissions will also be available, resulting in an instructional painted photograph depicting Schweder dressed as his collaborator enacting the first iteration of the performance within the participant’s space. Schweder will also exhibit photographs and drawings that interpret his ReActor (2016), a 40-foot modernist structure installed at Omi International Arts Center in Ghent, NY that spins and tilts with the wind and weight of its inhabitants. Taking location into account and conceived as an altered site-specific installation is Monument to Sacolândia (2010) by Clarissa Tossin. This representational sculpture of the Palácio da Alvorada—the first Oscar Niemeyer building and official residence of Brazil’s president—resembles the scale of an architectural model and is made entirely from empty cement bags. Sacolândia, or Bagland, was the popular name given to an informal settlement of shacks constructed from leftover cement bags, populated by laborers during the city’s construction. It was located in the depression that was flooded to become Paranoá Lake, its inhabitants relocated to the outskirts of the planned city. A video documents the sculpture being set afloat atop a Styrofoam base on Paranoá Lake with the palace’s gardens as its backdrop. Drawing attention to the irony of a “postcard image” of the city, a stack of postcards are free for taking. 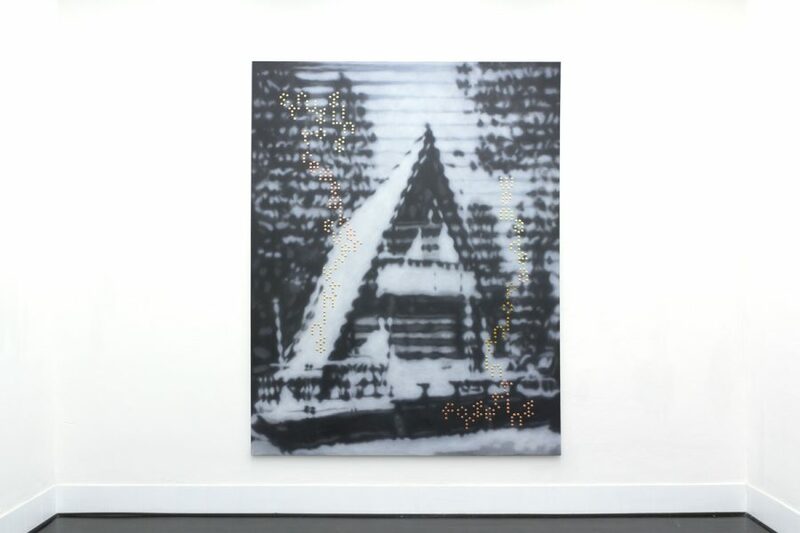 This work offers a critical intervention that also resembles child’s play by sending a drifting building around a lake. 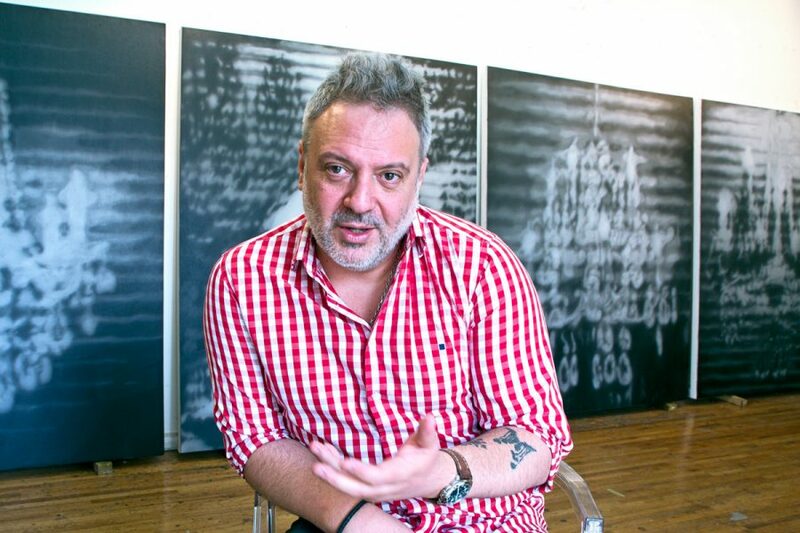 (Raúl Cordero interviewed by Alexandra Zagrebélnaia about his show “Words are wind / Le parole sono vento” at Federico Luger Gallery, Milan, Italy. Originally published at Milanweek Magazine). When did your life as an artist begin? Professionally, it was possibly when I had my first exhibition, back when I was 21 years old. I never intended to “be an artist”, though. Making art was always a fundamental need for me. It helped me be and it helped me understand the world, and I have never been able to stop. Eventually, society decides whether you deserve the status of an artist or not. This allows you to keep on putting on exhibitions, to live off what you create. That is what happened. Why did you chose the title ‘Words are Wind’? 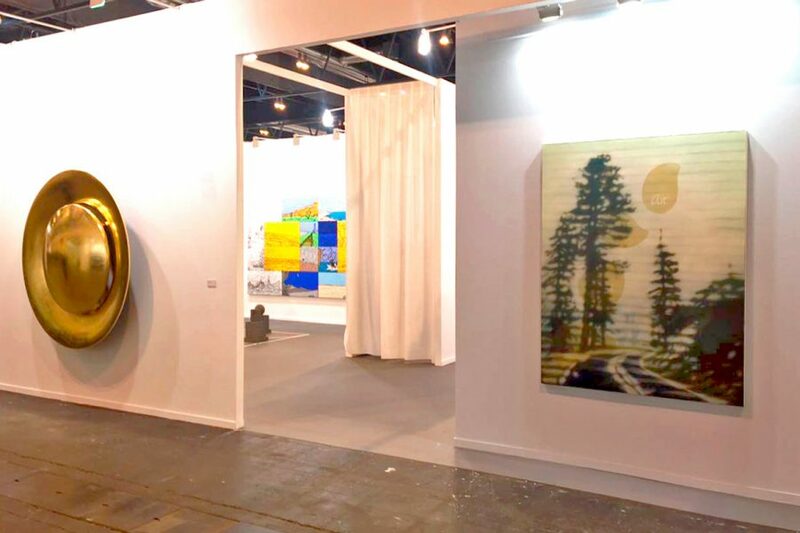 It is related to the idea that contemporary visual arts have used textuality in detriment of visuality for either conceptual or commercial reasons. 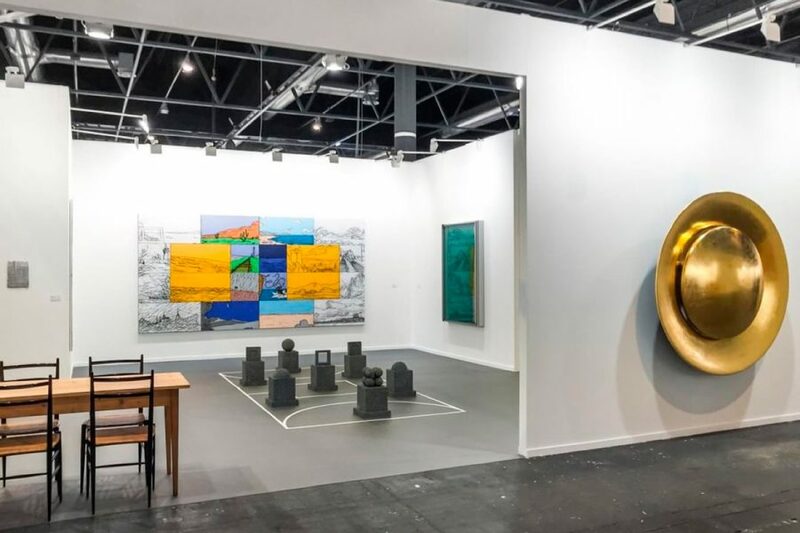 Contemporary art has generally become an exchange platform for ideas materialized in less and less visually interesting objects. Nowadays, words are the only instrument we have to teach visual arts. The discussion of concepts has replaced the creation of important visual phenomena. To me, visual arts should make people think from a visual aspect. From a cultural point of view, visual arts have refined the world’s “appearance” to the present day. Which is why one is able to understand works from different periods and sources mainly based on their visual characteristics, from gothic to modernism. Words are not enough to express these visual phenomena, they only work in the domain of other ideas. As such, for someone like me, who is spiritually fueled mainly from what I see, words are wind. Is there a special meaning to the signs you use? They are shapes born from the visual interaction within the works themselves, from the mixture of abstract and figurative elements. To me, in the end, they are spots that interact among each other. Colors and shapes. I also use words in my paintings, I give them a visual solution that makes it difficult to read them and distorts their function, turns them into drawings. They are conceptual works that question the text both in its visual nature and how they are perceived. I find your works with sailing ships very interesting. I wonder, have you ever thought where they are going? What harbor they’ll reach? Did you have a specific place in mind? Anything neglected by contemporary trends immediately catches my attention. I believe in the symbolism of the obsolete. When things become socially dysfunctional, they become relevant mainly for their symbolic, ethic and aesthetic value. That is why I paint landscapes, maritime and pastoral paintings, sailing ships, and other painting genres that at first sight differ from the “contemporary spirit”. They are works where the “how” is more important than the “what”. They are based on human virtue, rather than on the need to talk about everyday things. Virtue is timeless. Discourse changes every day. How do you feel about having an exhibition in Italy, a country with a major artistic tradition? I feel very lucky to be able to show these works in Italy, the cradle of western culture. The dialogue set by my art between classicism and cultural validation is very related to the essentialist debates of the Italian culture history. The decision-making, imposition, and western culture validation systems were born in Italy, in the imperial times. If you could share your studio with one of the classical Italian artists, who would you choose? 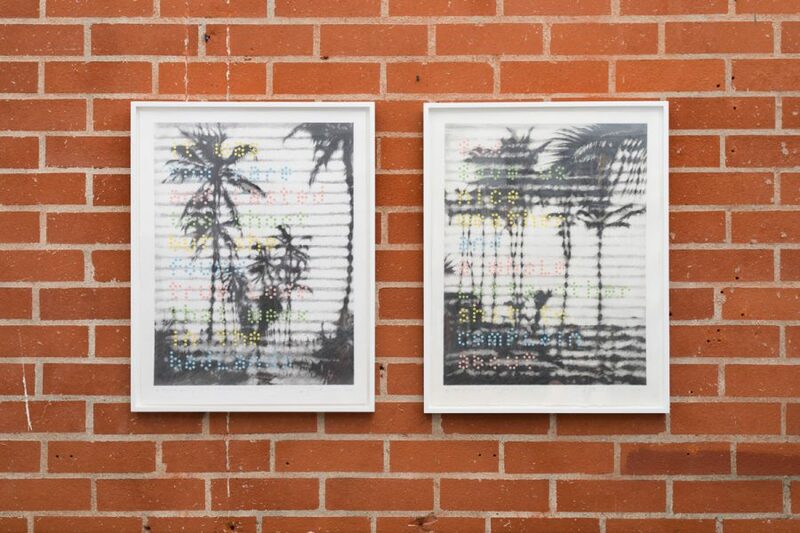 Federico Luger (FL GALLERY) is proud to present “Words are Wind / Le parole sono vento”, the first solo exhibition in Italy by the Cuban artist Raúl Cordero. 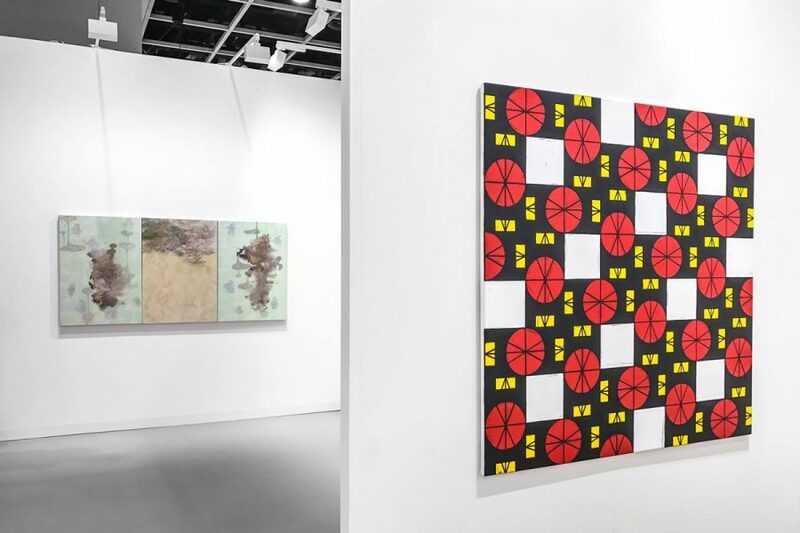 By means of recurring motives that he transforms and revisits, Cordero has created a universe of his own through his work, using computers and printing media to construct images that will finally become traditional oil paintings. 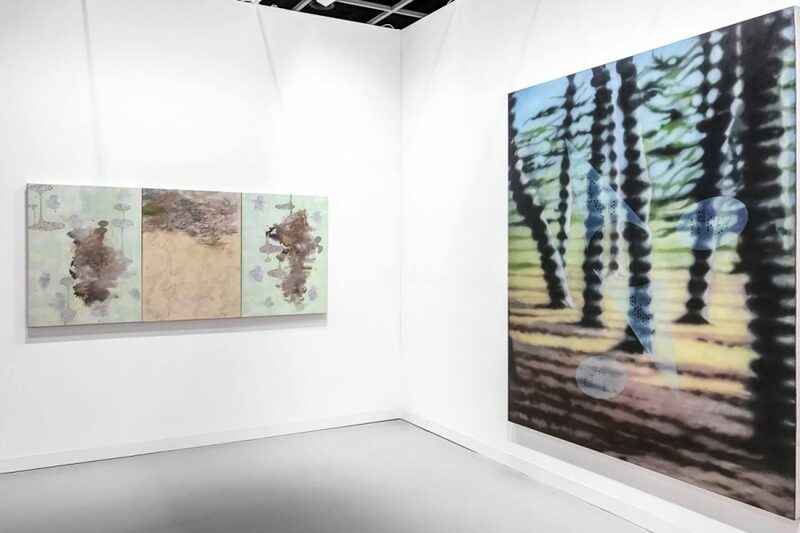 Taking his deep knowledge of western tradition of painting as a frame of reference, his work constantly revolutionizes the pictorial process by relying on contemporary technological breakthroughs. He uses this technology to celebrate the grandiloquence of the most important and historically innovative medium in art history: Painting. The relationship between what is apparently “old”, or “new” is also very important in Cordero’s work. 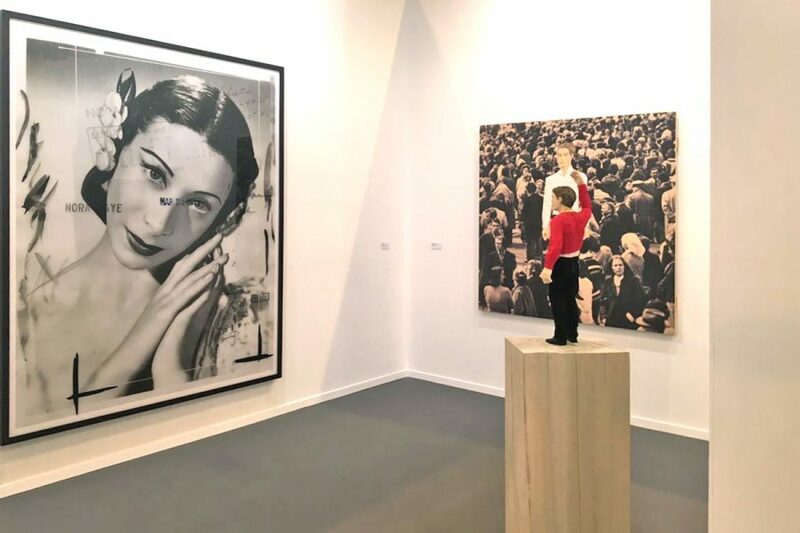 We live in a time when, due to the rapid pace at which technology has been replacing science and intellectual rigor, something “new” appears every single day —even in art. “New” is not a value anymore; it is a daily condition. For this reason, Cordero focuses on the symbolism of the obsolete, of what is no longer “useful”, but rather exists only for its aesthetic and ethical importance. This also grounds his preference for painting –and its classical themes as landscapes, seascapes, architecture and portraits-, whose importance nowadays is also more symbolic than functional, given that the slow and obsessive way of creating a traditional painting is inconsistent with the speed at which images are “obtained” these days. 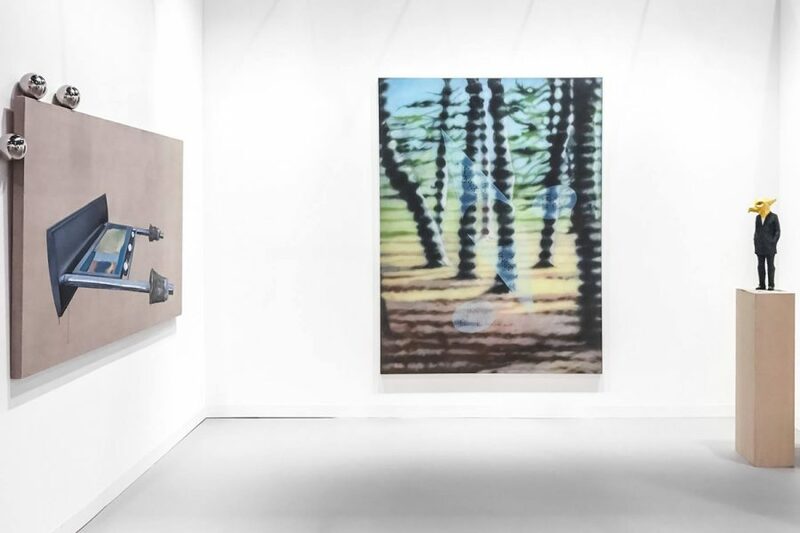 For this exhibition Raúl Cordero will present eight new paintings, depicting different open air situations, including Landscapes, Architecture, Sailboats, etc. 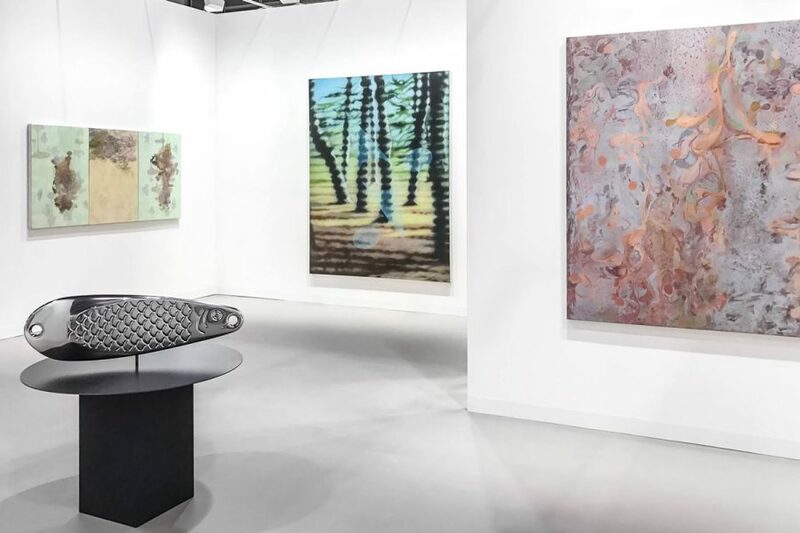 The images, done in subdued colors, depict the cohabitation of both a deconstructed figuration (soft-edge) and abstract forms (hard-edge), as well as a very personal way of adding and overlapping texts referring to the daily experience of making art nowadays. These texts are pierced to semi-transparent elements that feign crystalline “windows”, distorting the classical figure-ground perception. 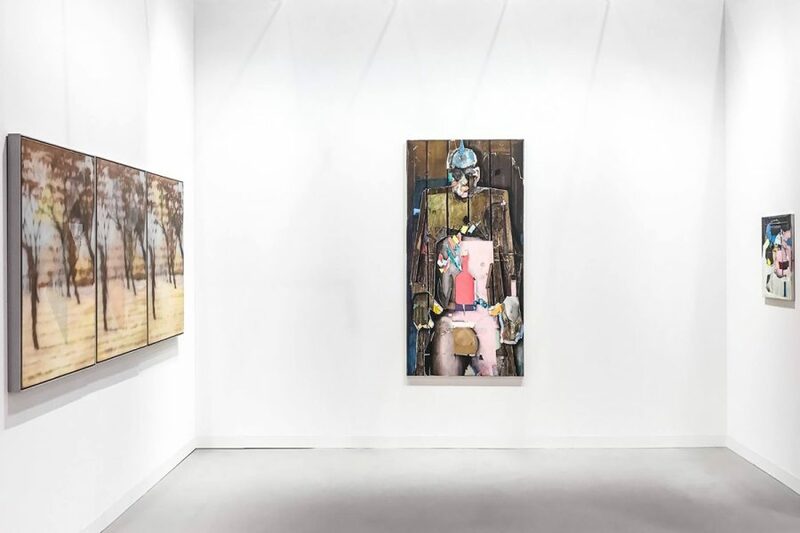 As a result, his work connects the figurative pictorial language with its subsequent metamorphosis into abstraction and the spirit of modernism. 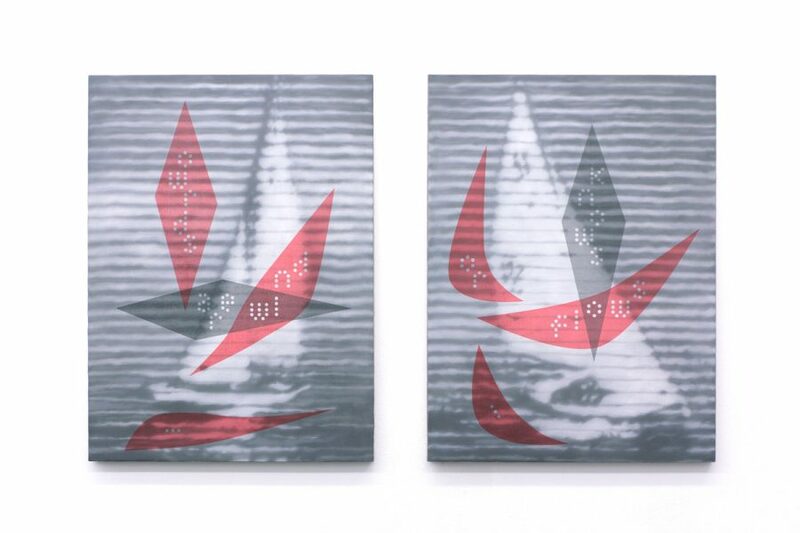 While at the same time, it questions how visual language has given way to textual information in contemporary art. Raúl Cordero was born in 1971 in Havana, Cuba and currently lives and works in Mexico City. He studied Fine Arts at the San Alejandro Academy and Design at ISDI in his hometown, to further pursue his studies at the Graphic Media Development Center and the Rijksakademie Van Beeldende Kunsten in the Netherlands. 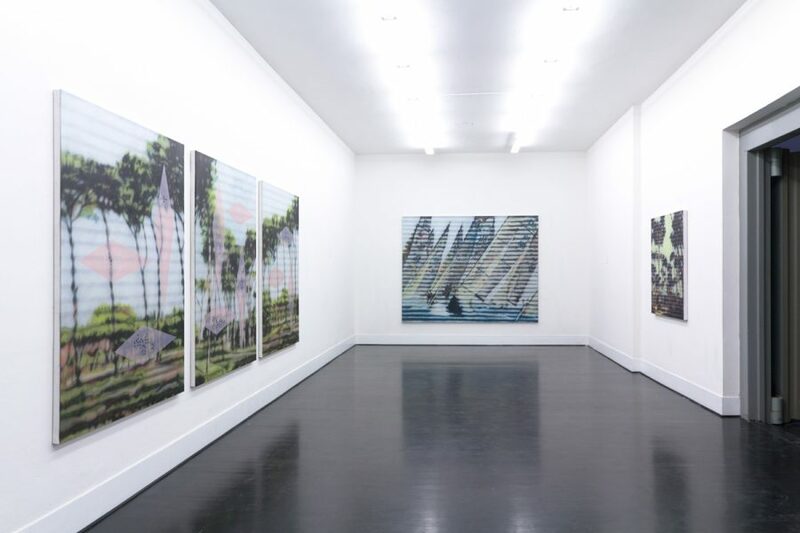 In the recent years, Cordero has focused his work on the new paths and developments of Painting. His work can be seen at prestigious public collections all over the world, including the National Museum of Modern Art – Center Pompidou in Paris, France; the Museum of Contemporary Art of Los Angeles County (LACMA); the Museum of Contemporary Art (MOCA); The Museum of Contemporary Art in San Diego and the Fort Lauderdale Art Museum in the United States; the National Museum of Fine Arts in Havana, Cuba, the Stedelijk Museum for Actuele Kunst (SMAK) in Ghent, Belgium; The Atlantic Center for Modern Art and the Ibero-American Museum of Contemporary Art (MEIAC) in Spain, among many others. 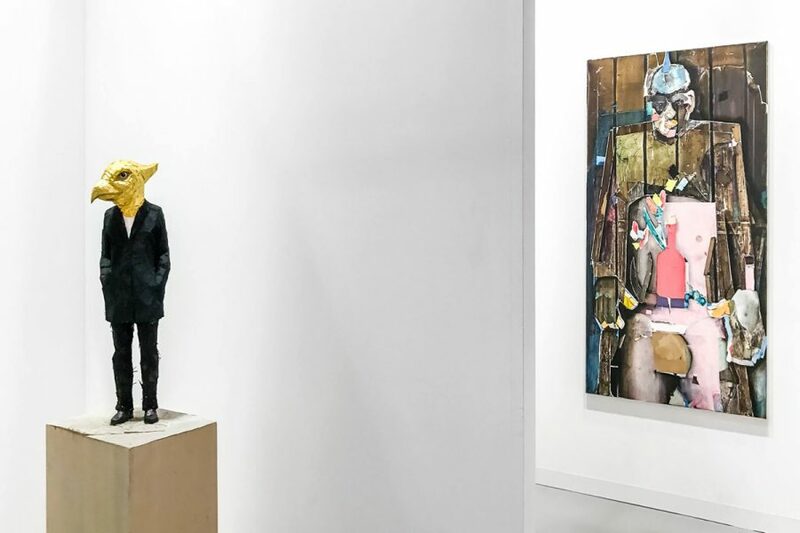 This exhibition is made in a collaboration with Mai 36 Galerie, in Zurich, Switzerland. 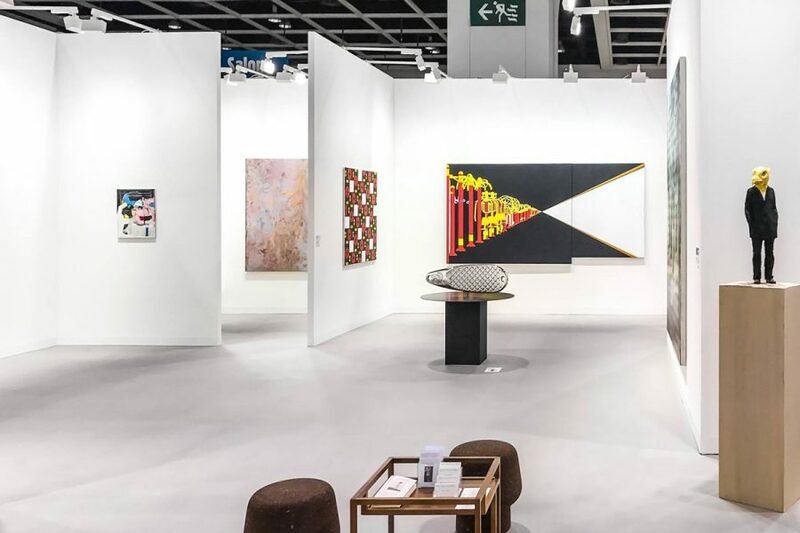 We are pleased to announce new works shown by Mai 36 Galerie at Art Basel Hong Kong 2017. 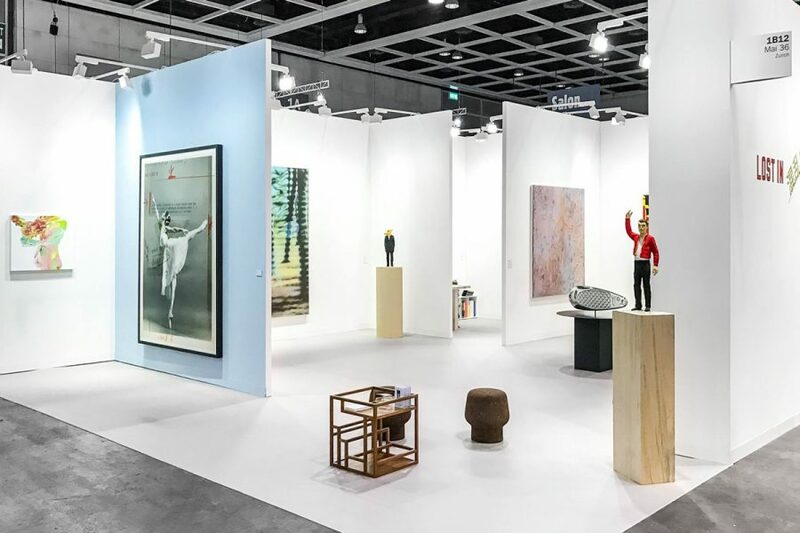 Artists on Mai 36’s booth: Stephan Balkenhol, Raúl Cordero, Jürgen Drescher, Pia Fries, Flavio Garciandìa, Zang Kun Kun, Matt Mullican, Magnus Plessen, Thomas Ruff, Lawrence Weiner and Michel Pérez Pollo. 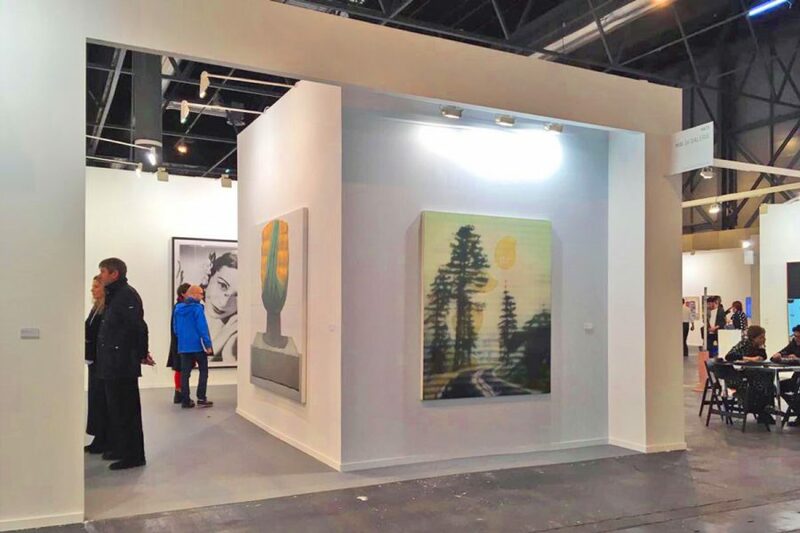 We are pleased to announce new works shown by Mai 36 Galerie at ARCO, in Madrid. February 24th through 28th, 2016. MAI 36 GALERIE. Booth 9A15. Franz Ackermann, Stephan Balkenhol, Jacobo Castellano, Raúl Cordero, Jürgen Drescher, Flavio Garciandía, Pedro Cabrita Reis, Robert Mapplethorpe, Matt Mullican, Manfred Pernice, Thomas Ruff, Michel Perez Pollo and Rémy Zaugg.